HP Hot Rod Protective Sleevings feature a heat protective thermal sleeving capable of withstanding 1200degreesF continuous and up to 2000 degrees f intermittent. This non flammable sleeve has a special weave that allows it to expand and contract over fittings. These sleeves can protect fuel lines, preventing vapor lock. They can also be used to protect wires from heat damage and allow you to hide your wiring. Add some heat protection and make your ride a trouble free and cooler one. Capable of resting directly on your motor without damage! 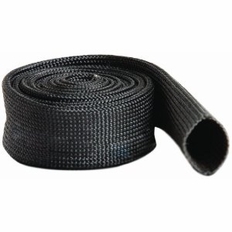 This product can protect up to a 1" line and comes in a length of 10 feet. You can easily cut the HotRod sleeve if you need it to be shorter.